EXECUTIVE SUMMARY: Many American detractors of Israel begin by citing that Israel receives the lion’s share of US military aid. The very suggestion conjures the demon of an all-powerful Israel lobby that has turned the US Congress into its pawn. But these figures, while reflecting official direct US military aid, are almost meaningless in comparison to the real costs and benefits of US military aid – above all, American boots on the ground. In reality, Israel receives only a small fraction of American military aid, and most of that was spent in the US to the benefit of the American economy. Countless articles discrediting Israel (as well as many other better-intentioned articles) ask how it is that a country as small as Israel receives the bulk of US military aid. Israel receives 55%, or $US3.1 billion per year, followed by Egypt, which receives 23%. This largesse comes at the expense, so it is claimed, of other equal or more important allies, such as Germany, Japan, and South Korea. The complaint conjures the specter of an all-powerful Israel lobby that has turned the US Congress into its pawn. The response to the charge is simple: Israel is not even a major beneficiary of American military aid. The numerical figure reflects official direct US military aid, but is almost meaningless compared to the real costs and benefits of US military aid – which include, above all, American boots on the ground in the host states. There are 150,500 American troops stationed in seventy countries around the globe. This costs the American taxpayer an annual $US85-100 billion, according to David Vine, a professor at American University and author of a book on the subject. In other words, 800-1,000 American soldiers stationed abroad represent US$565-665 million of aid to the country in which they are located. Once the real costs are calculated, the largest aid recipient is revealed to be Japan, where 48,828 US military personnel are stationed. This translates into a US military aid package of over US$27 billion (calculated according to Vine’s lower estimation). Germany, with 37,704 US troops on its soil, receives aid equivalent to around US$21 billion; South Korea, with 27,553 US troops, receives over US$15 billion; and Italy receives at least US$6 billion. If Vine’s estimate is correct, Japan’s US military aid package is nine times larger than that of Israel, Germany’s is seven times larger, and Italy’s is twice as large. The multipliers are even greater for Egypt. Even the Lilliputian Gulf states, Kuwait and Bahrain, whose American bases are home to over 5,000 US military personnel apiece, receive military aid almost equal to what Israel receives. Yet even these figures grossly underestimate the total costs of US aid to its allies. The cost of maintaining troops abroad does not reflect the considerable expense, deeply buried in classified US military expenditure figures, of numerous US air and sea patrols. Nor does it reflect the high cost of joint ground, air, and maritime exercises with host countries (events only grudgingly acknowledged on NATO’s official site). US air and naval forces constantly patrol the Northern, Baltic, and China Seas to protect American allies in Europe and in the Pacific – at American expense. Glimpses of the scale of these operations are afforded by incidents like the shadowing of a Russian ship in the Baltics, near run-ins between Chinese Coast Guard ships and US Navy ships dispatched to challenge Chinese claims in the South China Sea, and near collisions between US Air Force planes and their Chinese counterparts in the same area. In striking contrast, no US plane has ever flown to protect Israel’s airspace. No US Navy ship patrols to protect Israel’s coast. And most importantly, no US military personnel are put at risk to ensure Israel’s safety. In Japan, South Korea, Germany, Kuwait, Qatar, the Baltic states, Poland, and elsewhere, US troops are a vulnerable trip-wire. It is hoped that their presence will deter attack, but there is never any assurance that an attack will not take place. Should such an attack occur, it will no doubt cost American lives. This cannot happen in Israel, which defends its own turf with its own troops. There is no danger that in Israel, the US might find itself embroiled in wars like those it waged in Iraq and Afghanistan at a cost of US$4 trillion, according to Linda J. Bilmes, a public policy professor and Harvard University researcher. Japan’s presence at the top of the list of US military aid recipients is both understandable and debatable. It is understandable because Japan is critical to US national security in terms of maintaining freedom of the seas and containing a rising China. It is debatable because Japan is a rich country that ought to pay for the US troops stationed within it – or in lieu of that, to significantly strengthen its own army. At present, the Japanese army numbers close to 250,000, but it is facing the rapidly expanding military power of its main adversary, China. A similar case can be made with regard to Germany, both in terms of its wealth and its contribution towards meeting the Russian threat. What is incomprehensible is not why Israel receives so much US military aid, but why Japan has received nine times more aid than Israel does. This is a curious proportion given the relative power Israel possesses in the Middle East and its potential to advance vital US security interests in times of crisis, compared to the force maintained by Japan relative to China. Ever since the Turkish parliament’s decision in March 2003 not to join the US-led coalition, and the Turkish government’s refusal to allow movement of American troops across its borders, Israel has been America’s sole ally between Cyprus and India with a strategic air force and (albeit small) rapid force deployment capabilities to counter major threats to vital US interests. It takes little imagination to envision these potential threats. Iran might decide to occupy Bahrain, which has a Shiite majority seriously at odds with the ruling Sunni monarchy. It might take over the United Arab Emirates, which plays a major role in the air offensive against the Houthis, Iran’s proxies in the war in Yemen. There might be a combined Syrian and Iraqi bid to destabilize Sunni Jordan, in the event that both states subdue their Sunni rebels. Any of these moves would threaten vital energy supplies to the US and its allies. Only Israel can be depended upon completely to provide bases and utilities for a US response and to participate in the effort if needed. The politicians, pundits, and IR scholars who attack Israel and the Israeli lobby for extracting the lion’s share of US military aid from a gullible Congress know full well that this is not true. Israel receives a small fraction of the real outlays of military aid the US indirectly gives its allies and other countries. These experts also know that 74% of military aid to Israel was spent on American arms, equipment, and services. Under the recently signed Memorandum of Understanding, that figure will be changed to 100%. The experts simply cite the wrong figures. The US is now led by a businessman president who knows his dollars and cents. He has been adamant about the need to curb free-riding by the large recipients of real US aid. 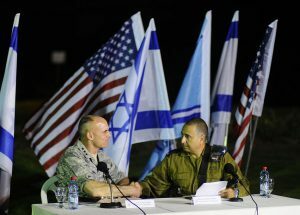 He will, one hopes, appreciate the security bargain the US has with Israel – a country that not only shares many common values with the US, but can make a meaningful contribution to American vital interests with no trip-wires attached.